Ivan and Martha Warmuth visited a memorial Sunday near where their daughter Allison was struck and killed by a duck boat tour vehicle. 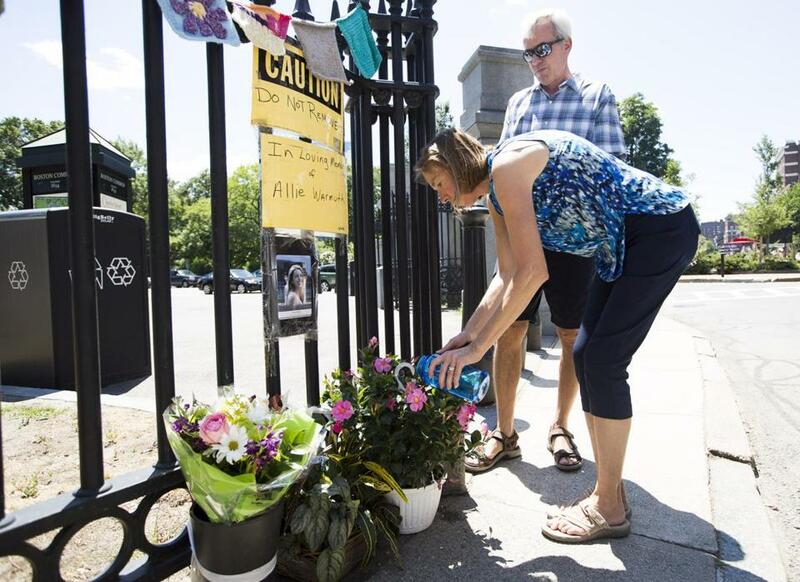 As Martha and Ivan Warmuth watered flowers Sunday at the intersection where their daughter Allison was struck and killed by a duck boat in April, three of the famous sightseeing vehicles roared past them. Each time one passed, Martha’s eyes followed. “What really bothers me is when I see a driver being distracted,” she said. The Warmuths believe additional safety features on duck boats could have prevented the death of 28-year-old Allison, who was riding her red motor scooter around the city on a sunny spring morning. In the months since the accident, they have channeled their grief toward pushing for public safety changes in Boston. “We want to be advocates for safety in honor of our daughter, so anything that we’re doing we feel is therapeutic,” Ivan said. Allison was driving her friend on her motor scooter on April 30 when they stopped at a red light on Charles Street, waiting to turn right onto Beacon Street. When the light changed, the duck boat, also looking to turn right, rammed into the back of the scooter. Her parents, who are from Plattsburgh, N.Y., and live in Hawaii part time, are now staying in their late daughter’s apartment on Beacon Hill. They are steps away from the State House where they hope a bill placing new regulations on duck boats passes by the end of July. 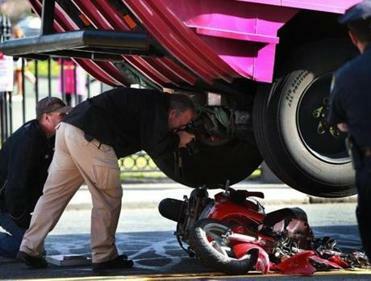 The legislation would require vehicles designed to operate both on land and in the water — such as the duck boats — to contain blind-spot cameras and sensors that would indicate when another car or motorcycle is nearby. As well, it would prohibit drivers from also narrating history and identifying landmarks while operating the vehicle. The Warmuths spend some of their days in Boston at street safety meetings about pedestrians, bikers, and motorists. They also attend events held by the Boston Cyclists Union, where they hand out lights and reflective stickers to bikers so cars can better see them. In between all the meetings and hearings, they always make time to water the flowers at the intersection where their daughter died, and watch cars zip around the corner when the light on Charles Street turns green. On Sunday, the Warmuths spoke of Allison, who saw joy in everything. She juggled a job, marathon training, and her many friends in Boston, where she lived for six years. On nice days, she would wind through Boston on her red scooter. On all days, she would knit. Allison loved her job as an insurance underwriter at Lexington Insurance, a subsidiary of AIG, sometimes dancing by her desk when she would solve a problem. She took pride in the new job she was offered in Chicago, which she would have started June 1. Since the accident, Cindy Brown, chief executive of Boston Duck Tours, said the company has taken steps to improve the safety of its vehicles. Brown said that the company is waiting for the city of Boston to finish its investigation before making any further decisions on changes to its vehicles. The state Legislature’s joint Committee on Transportation will hold a hearing on the duck boat safety bill Thursday. As the Warmuths wait for accident reconstruction results, which they have been told could take up to six months, they said the depths of their sorrow are sometimes overwhelming. She said living in their daughter’s Beacon Hill apartment is somewhat therapeutic. But when the duck boats pass, they are reminded of their daughter’s fate — and their determination to make sure it never happens to anyone else.